When I decided to read The Kiss Thief I hadn’t read the synopsis. I just saw that gorgeous cover with L.J. Shen’s name on it. I have been a fan of her writing for while now, and I was content to pick up anything she writes. That being said, I might have hesitated more had I realized there was a love triangle aspect to this one. I am not really a fan of that trope, but I’ll come back to that more later. Anyway. I went into this one blind, for the most part, and I am glad I did. I ended up enjoying The Kiss Thief. I might have missed out on reading it had I read the blurb first. I was surprised by how much I enjoyed the arranged marriage part of The Kiss Thief. Francesca and Wolfe started out at odds and I loved seeing their resolve slowly melt away. Francesca was young and a little delusional when it came to how life works, but I could forgive her that based on how she was brought up. It allowed for her to be filled with wonder at the perfect times in the story. Wolfe was an alpha jerk. He had his reasons, but he was hard to stomach at times. What else would you expect from L.J. Shen, though? Francesca would become the one crack in his armor, and I loved the way she chipped away at it. I only had one problem with their relationship. That problem is a spoiler, so I’ll just say there was a scene I couldn’t forgive Wolfe for. It made me mad and uncomfortable. But wait, you say. Isn’t this a love triangle? Yep. Like I said before, I’m not a fan of love triangles. I wouldn’t say this one read like a true triangle, but close enough to irritate me at times. Mostly because I wasn’t an Angelo fan. Angelo is the man Francesca should have married. He’s the man she’s loved, the man willing to put everything on the line for her. There is a tenderness between them that Francesca doesn’t have with Wolfe. Angelo is everything Francesca has wanted. He causes problems for her with her husband to be, and makes Francesca question who she should be with despite what her father has arranged. I liked what Angelo added to the story, but I cringed a lot when he was involved. I just wanted him to go away so I could get back to Francesca and Wolfe. I picked my hero early despite his disposition. The mob aspect of this love story added some interesting fun and even more intensity to this story. I loved how Wolfe became involved with Francesca’s father. It was entertaining to see how it all played out. Overall, I found The Kiss Thief to be an addicting, dark romance. It is exactly what I have to come to expect from L.J. Shen. She manages to make me fall in love with characters I should hate. When the Beautiful Hearts Duet released this past summer I wanted to read it, but I was hesitant. I know the power of Emma Scott’s writing, and I was scared to feel what her words would invoke. I also knew it had a love triangle of sorts, and I hate those. In the end, I gave in and read the duet because I knew it would be good and all of the reviews were coming in with high praise. I have to start out by saying that the acknowledgements and dedications at the beginning of this book had me in tears. That didn’t bode well for my emotions. I have to be honest and say I didn’t love this book. It made me mad because of the love triangle built on lies. I was so frustrated with Weston, Connor, and Autumn while reading it. Weston made me mad because of his dedication to Connor. Connor made me mad because of his attitude about just about everything and his poor decisions. Autumn I wasn’t really mad at. I was more irritated because I wondered how she could really be so blind…but then aren’t we all when we’re falling in love? Overall, the writing was beautiful. The poems in this book…WOW. The emotions brought on by this book…WOW. The ending…DANG. There’s no way I could take a break between books 1 and 2. I don’t even know that I have the words to tell you how much I loved this book. This one starts off emotional and strong. It wasn’t quite what I expected, but I ended up loving the direction Emma Scott took this story. I grew to really love Autumn, Weston, and Connor. How everything worked out wasn’t always easy, but it was perfect. The easy moments were almost too easy, but I didn’t mind that because I felt everything come full circle. Bravo, Emma Scott. You did your readers, yourself, and your precious daughter right. This past weekend I knocked Love Me with Lies off my backlist. It’s been on there for years because I’m a fan of all of Tarryn Fisher’s other books. I’m so disappointed in myself for waiting so long to read it. It was crazy good — emphasis on the crazy. Here my thoughts after reading each book. I’m stuck using emojis for this review because I’m speechless after finishing this book. It was soooooo messed up, but in a good way. Only Tarryn can make me hate and love characters so much at the same time. This one started out bad for me. I was so disgusted by Leah. I hate Leah, but I understand her now. She grew on me as her story went on. She’s not blameless, but Caleb isn’t either. I lost some respect for him in this one. The only person I started to respect more was Olivia. I think I liked this book? It’s hard to know because all of the characters were so messed up. I didn’t think I could end up liking them any less while also liking where the story went. I do think it was a fitting end to a crazy, addictive series. Overall, this is a very messed up, crazy, addictive series. If you like books that will shock you and make you question everything a character does, read this series. Every glare from those fire-spitting eyes, every time she grits her teeth, gets me…well, you know. They say even rich men don’t always get what they want, but those men don’t know how to play the game. The trick is to keep them guessing. If you have never read a book by Kennedy Ryan, you are truly missing out. She is a phenomenal writer. The books she writes are the total package. Her stories are romances with powerful messages. There’s a social awareness to them that make them stand out. Her words and the stories they create are beautiful and impactful. I’m always a little nervous heading into one of her books because I know it’s going to make me feel all the things. 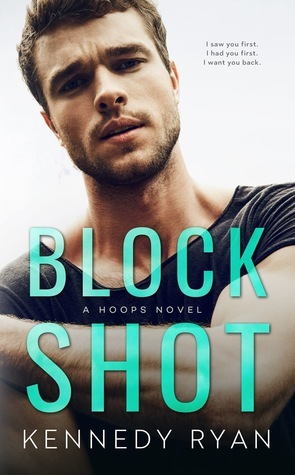 I was especially nervous (and excited) to start Block Shot after the emotional rollercoaster I experienced in Long Shot, the first HOOPS novel. From the minute I started Block Shot, I was hooked on Banner and Jared’s story. I loved how it started with their past. So much of their present was tied to their past. It influenced the way they dealt with each other, especially on Banner’s side. It made me excited to find out how they would end up together. For me, the thing (or person) that made Block Shot amazing was Banner. She is one of those characters that I can see bits and pieces of myself in. Banner walked a fine line between being self-confident and filled with doubt. She knew she slayed at parts of her life, and she knew what her downfalls were. I liked that because I think no matter how confident a woman portrays herself, there’s always some insecurities hiding in the background. I loved how Banner took ownership of those negatives and put forth the effort to make them positives. It was inspiring to say the least. My feelings for Jared are a little mixed. I had moments I loved him and moments I didn’t. I, personally, wouldn’t call him a swoon worthy main character. Jared was a highly flawed, like many of us are. He wasn’t a good guy, but he never claimed to be. I respected that, but I also didn’t like how he let that fact enable his decisions. Jared wasn’t all bad, though. He didn’t take the easy way out on anything. Jared worked hard for what he accomplished. The best thing about Jared was how he saw Banner. Despite not falling completely in love with Jared’s character, I did love his relationship with Banner. They were a great match. Their story surprised me, though. I didn’t expect the nature of the obstacles that stood in their path. I should have known there wouldn’t be an easy fix for them (This is a Kennedy Ryan novel, after all. ), but I guessed I hoped there would be. Their initial problem was a simple misunderstanding. I should have known that wouldn’t be the only thing they would face. There had to be some major hurdles and heartbreak. In the end, all of the good, the bad, and the ugly made for a touching love story. There was only one thing that kept Block Shot from being a five-star read for me. A boundary was crossed that Banner tried to set with Jared. It was a boundary I believe in. I was disappointed that Jared had no problem using any excuse to cross that boundary. It made a big impression on how I felt about him and this book. His actions actually made me put the book down and walk away for a while because I was uncomfortable and afraid of what was to come. Everything that stemmed from his actions wasn’t all his fault. Banner played a part as well, which honestly shocked me, so I have some negative feelings about her as well. I guess when it comes down to it, I think the book would have still been as impactful without this part. I can understand in the end why Kennedy Ryan made the choices she did, but it isn’t something I love to read about. Overall, Block Shot was a really great read. I loved the connection between Jared and Banner. I adored Banner and identified with her in so many ways. I know other women will, too. Honestly, that’s the most important part of this story. For better or for worse,’til death do us part . . . The better captured me; she’s who stole my heart. The worse of her took my breath away–kicked me when I was down and twisted me into a million knots. But life isn’t always perfect. You have to take the better and the worse–even if it means giving her up, having her slip between your fingers, and letting her walk away. This is forever, ’til death do us part. Meghan Quinn has a crafty way of making you want what you thought you didn’t want and would never want. She played with my emotions. I loved this book, but my gut was aching while reading parts of it. This book made me remember why I loved a certain character. He was better than I had him in my memory and that’s saying a lot. I have so much respect for this fictional character! I liked one of the main characters WAY more than I expected to. This person wasn’t one of my favorite characters from the Blue Line Duet. The last I read of the person, I was like, No! Wait! What?” I didn’t get it. I do now. My heart broke with some revelations. I was so crushed. I can’t even get into it because SPOILER!, but man! I loved the new-ish characters. Although, one made me very nervous! There are some AMAZING quotes that people are going to identify with and love. I can imagine that people are going to be using them a ton. THE ENDING!!! I’m devastated. Not in the same way as I was with the Blue Line Duet. That was anger. This is sorrow. I loved this book, and I’m so happy that I have the next book in the duet, The Right Side of Forever waiting for me to start right now. In sickness and in health, to love and to cherish . . . It sounds so simple, to love someone unconditionally. To give them your heart. So why is she slowly eating away at my soul with every unanswered phone call, every unread text, and every door left unopened? She said yes, and yet, in order for her to be with me . . . I need to let her go. You know those books you finish and you feel like you don’t even have the words to describe how special they are? The Right Side of Forever was one of those books for me. It was perfect in every way. It made me smile and it made me tear up. It not only made me think of what the characters were going through, but of my own thoughts and actions. The Right Side of Forever brought the journey that started in the Blue Line Duet full circle. I finally understood all of Meghan Quinn’s plot choices and I wouldn’t have her change a thing. The amount of character growth and emotion that went into this book was amazing. The Right Side of Perfect was the perfect conclusion to this story and the one that really started four books ago. Now, I just have one question for Meghan Quinn…Will she ever write a book about any of these other Air Force guys? I wouldn’t mind a Rowdy story. Just sayin’. If you haven’t read The Upside of Falling (Blue Line, #1), stop right here. I’m not planning on posting spoilers in this review, but that book must be read prior to this one. You can find my review for The Upside of Falling here if you’re curious. Now, onto my review. The end of The Upside of Love threw me for a loop. I wasn’t expecting things to go down the way they did. I was so shocked. I had some major feelings about how everything went down with Colby and Rory. I was really angry I was left hanging the way I was. The Downside of Love (and its early release) made up for all my frustration. I was pleasantly surprised by it. Meghan Quinn did amazing things with both her writing and her characters. Like the first book in the duet, it wasn’t what I was expecting. I didn’t think that was going to be a good thing, but it was. I loved how things ended up. I can’t imagine the Blue Line Duet characters’ story ending any other way now. It was an emotionally raw and thought-provoking read. Bravo, Meghan Quinn! After years of gravitating to douchebag players with no more to offer than a wildly good time and zero promises, single mom Drew has graduated to dating a real man. He’s the responsible, mature kind—willing and able. To offer her and her daughter a real future. More like a ten, is her first thought when introduced to the tatted-up, foul-mouthed, unapologetic player. The guy might’ve been her kryptonite five years ago. With every new encounter she has with Nine, she begins to realize there’s so much more to him than just good looks and his bad boy image. She sees a vulnerability in him she never expected. Worse yet, he’s sending out vibes that whisper of promises he’s never made to any girl before. Is she willing to trade in Mr. Perfect for someone who’s one impetuous decision away from proving that her first impression may have been heartbreakingly spot on? After having spent a little bit of time with Nine and Drew in Beast, I was excited to read their book. Nine was everything I was expecting it to be. It was classic Elizabeth Reyes. It had her signature alpha male and strong female with a plot that kept me reading. Nine was the typical single man who wasn’t looking for commitment…until he met Drew. She was his game changer. He didn’t know how to show her he was willing to change his ways for her, but Nine was going to do everything he could to convince her. I loved what softie he was under his tough exterior. Drew was a woman whose heart and mind were at war. She thought she knew what she needed and wanted, but Nine threw a wrench in her plans. I loved her relationship with her daughter and her ex. It was so sweet. I also loved how her attraction to Nine questioned her beliefs. Nine and Drew’s journey to love wasn’t simple. It was filled with real life situations and problems. I really enjoyed how their story unraveled. If you’re a fan of the Boyle Heights series, you’re going to love seeing Nine and Drew give in to their temptations. In this sequel to the acclaimed Simon vs. the Homo Sapiens Agenda—now a major motion picture, Love, Simon—we follow Simon’s BFF Leah as she grapples with changing friendships, first love, and senior year angst. It’s hard for Leah to strike the right note while the people she loves are fighting—especially when she realizes she might love one of them more than she ever intended. I might be the only one who feels this way, but I thought Leah on the Offbeat was even better than Simon vs. the Homo Sapiens Agenda. I loved Simon, but it took me almost until the end to appreciate it as much as I did. I was in love with Leah from the beginning. She wasn’t perfect. Leah had some major flaws, but they made her easy to relate to. Her world was changing. Even when she was fighting those changes or making dumb decisions, I could understand why she made the choices she did. Leah was afraid to put herself out there and get hurt or hurt her friends. I loved the reality of those situations. I’ve felt that way so many times in my life. What struck me most about Leah and this book were the relationships in it. Everything that happened with Leah and her friends reminded me of some of my own school friendships. There’s always drama and ups and downs with friendships in high school. This book did an excellent job portraying friendships and how they evolve. It was my favorite part of the book. Well, besides Leah’s relationship with her mom. I loved that. Leah wasn’t the nicest to her mom, but when are we ever the nicest to the people who love us unconditionally when growing up? It was a good reminder to me that our parents are people, too. I still forget that even as an adult sometimes. Overall, I adored listening to this book. Becky Albertalli’s writing was as amazing as always. Her characters were complex but easy to love. Shannon Purser brought life to Leah in an unforgettable way with her voice. Leah and the Offbeat is one of my favorite YA audiobooks I’ve read so far this year. Recently, I did a binge listen to the Sea Breeze series audiobooks. Rather than try to review them separately, I’m going to review them all here. This is exactly the type of book I want to read in the summer. It was a cute rock star romance in a fun, beachy setting. I adored both Sadie and Jax. They were perfect together. It wasn’t all sunshine and rainbows, and I liked that. Breathe was a very sweet story. After meeting Marcus in Breathe, I wanted to see him get is happy ever after. He deserved a nice girl after missing out on Sadie. Low was definitely that girl! I could see exactly how their story was going to play out, but I didn’t mind that. Because of Low was so much fun to read. This book was even better than the first two books. I was surprised because Cage wasn’t my favorite person in Because of Low. His womanizing ways disgusted me despite the fact that he was a great friend to Low. What made this book so amazing was Eva. Her story was so heartbreaking and I loved how Cage helped heal her heart. I have mixed feelings about this one. I liked Preston and Amanda together, but Preston’s choices bugged me. I didn’t like his job and how he put Amanda at risk with it. It was just wrong. I couldn’t get past that. I wasn’t prepared for this book. I was in this state of angst from the prologue. I loved Cage and Eva in While It Lasts and I wasn’t ready for them to be torn apart. I hated that, but I loved how everything worked out. Cage and Eva were so perfectly sweet together. I do have to admit that I had to switch from the audiobook to the ebook because I couldn’t handle listening to it. I had to read it so that I could get through it faster. Jess surprised me in this book. She was the “bad girl”, but she went from bad to good very quickly. She didn’t seem much like the girl I met in the earlier books. That didn’t really bother me, and I enjoyed her story. I liked Jason, too. His story of trying to step out of the shadow of his brother was understandable. I also liked Jess and Jason together. What I didn’t like was Jess’ involvement with other people. I wish that would have been left out. Otherwise, I enjoyed listening to this book. I was happy this was finally a book about a girl who wasn’t so innocent like the rest of the series’ heroines. I liked listening to this book. I loved Blythe. She was so sweet and sheltered. Her past intrigued me. I loved her with Krit. I loved Krit when he was with her. What I wasn’t so fond of was his hooking up with other chicks before they got together. It wasn’t very enjoyable reading about his exploits knowing Krit and Blythe would end up together. I loved Sienna and her story. I wasn’t so sure about Dewayne because I didn’t like him in all of the other books. He redeemed himself, but he was an idiot when it came to Sienna for most of the book. I am happy they ended up together. They were really too cute. Throughout the Sea Breeze series, Trisha and Rock are there to support their friends. I heard stories of how their love originated through their friends’ stories, but those didn’t compare to getting their stories from them. I loved Trisha and Rock’s romance. It went back and forth between the past and present. The whole thing was so sweet. Their love story was a 5 star read — until the book abruptly switched half way through from being about them to mini epilogue novels about the characters from all of the other novels. Don’t get me wrong, it was fun to catch up with all of them. (Although, it seemed everyone was engaged, pregnant, or having a wedding. Their stories were way too similar to each other right down to the men appreciating a certain asset of their woman.) I just would have rather had more of Trisha and Rock. I thought maybe it would end with them to completely wrap everything up, but it didn’t. It ended with Bliss and Nate Finlay. I know that’s to prepare for the Sea Breeze / Rosemary Beach spinoffs, but it felt out of place. This book is definitely worth reading if you’re a fan of the series, though. Abbi Glines’ Sea Breeze series was one of those guilty pleasures to listen to. The books weren’t earth shattering or life changing, but they were fun and put me in a summery mood. My biggest complaint about the series was the pattern of sweet, innocent young women and guys who have been around the block several times falling in love. I kind of like it, but it also got a little redundant. Each character had different life experiences, but their sexual ones mimicked each other a little too much. All in all, I enjoyed the experience of listening to Shayna Thibodeaux, Kirby Heyborne, and Sebastian York narrate. If you’re looking for some mindless summer reading, this is a fun series.